Newcastle manager Alan Pardew is unhappy that his family and friends have been caught up in the debate surrounding his future. Newcastle have won only five games in 2014 and are second bottom of the Premier League this season, leading to calls for Pardew to be sacked. He said: "My family and friends worry me a little bit, because it's started going past football media at times. "That's not nice. But it makes me more determined. That's the make-up I have." Pardew signed an eight-year contract extension in September 2012 but Newcastle have taken only 19 points from 26 games since Boxing Day last year. They have not won in six league matches this season. Fans recently created a group called sackpardew.com, which handed out 30,000 A4 posters calling for his dismissal at last week's home draw with Hull. Owner Mike Ashley reportedly said Pardew was "finished" if Newcastle lost to Stoke on Monday, which they did. 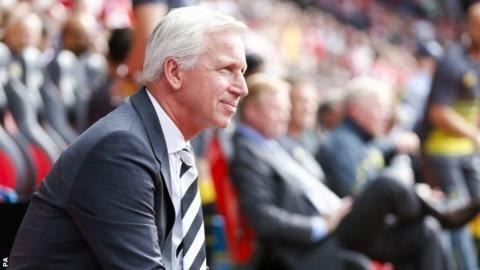 "I don't shy away from it and I'm not going to hide," Pardew said of the increasing speculation. "I'm not holding any grievance against the media, or some of our more militant fans, or the guys who printed the posters. "I've been out and about and had a few fans telling me their opinions, quite strongly. A few cars are diving a bit too close to me. "I get it. I will go home, shine my manager of the year trophy and give myself a bit of confidence." Pardew, 53, said he had had no contact with Ashley, but that he had spoken with chief executive Lee Charnley. "We discussed ways of trying to help the team - ways of trying to find a solution to try and get this team playing to its capacity," Pardew said.